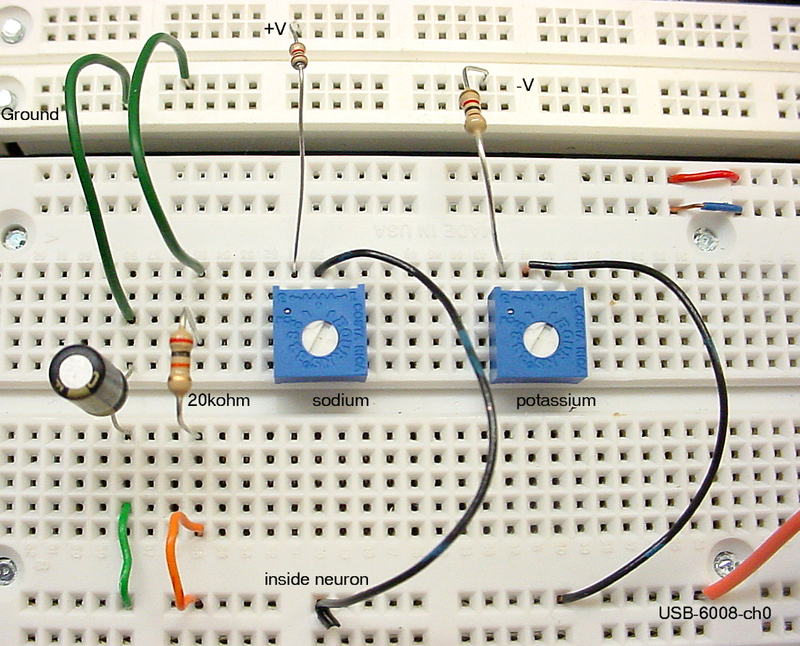 You will build a simple, active model of a neuron with variable sodium and potassium conductances, then use use Matlab programs to probe the electrical characteristics of the model. 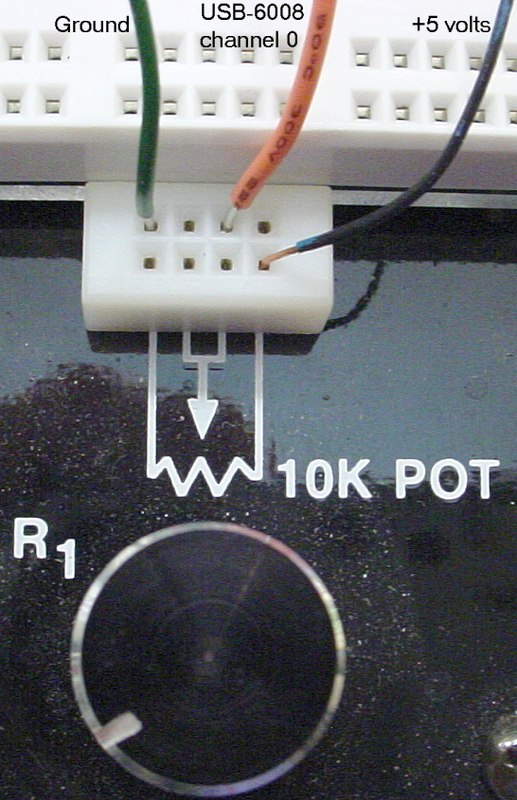 You will need to use the USB-6008 analog interface that you used in lab 5. Connect analog input channel zero as shown below to the 10Kohm potentiometer near the bottom of the prototype board. Download the slowAIni.m program and run it while you turn the knob on the potentiometer. 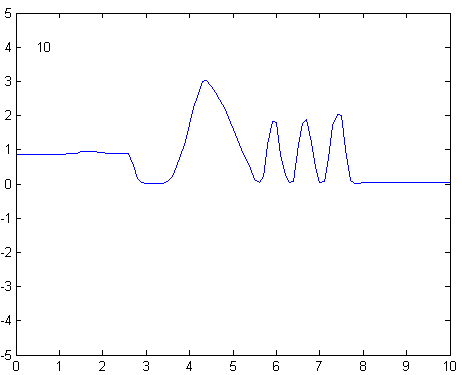 You should be able to draw a voltage trace like the one shown below. Build the circuit shown below. 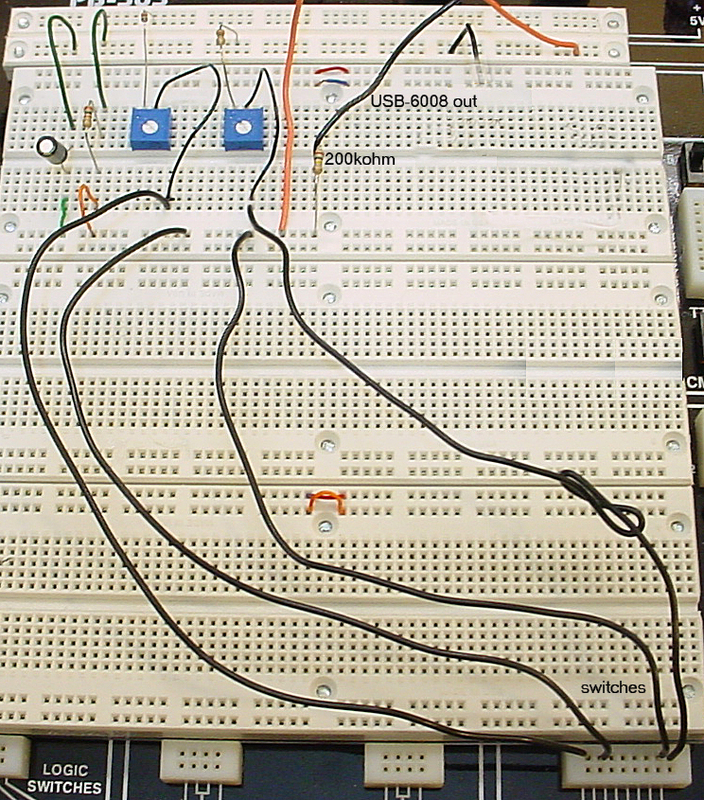 The circuit is based on information given in the reference at the bottom of the page. 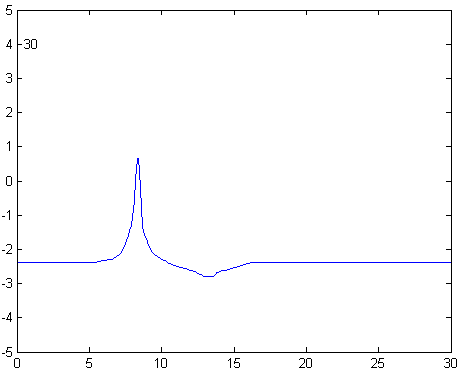 It is a simple simulation of a small piece of neuronal membrane with three channel types modeled as resistances. A lower resistance (higher conductance) implies more open ionic channels. The three conductances are a fixed leak, variable sodium and variable potassium conductance. 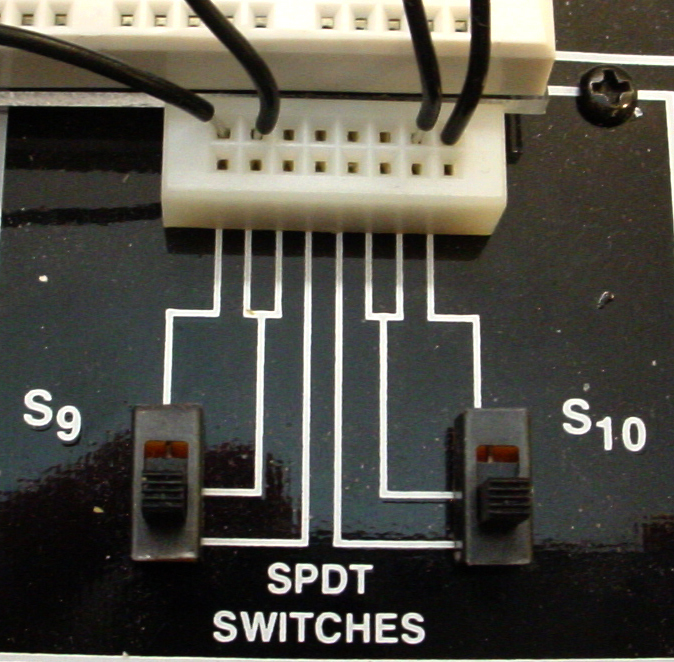 The two connections to the batteries marked with asterisks are internally connected in the protoboard. Set +V to 1.5 volts and -V to -3.0 volts. 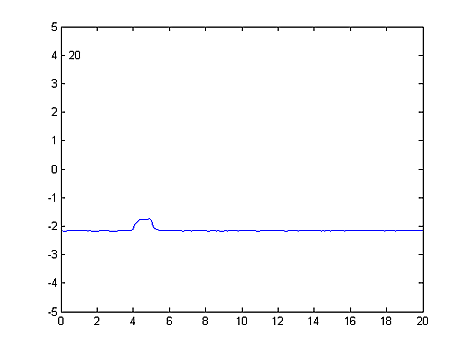 These voltages are about a factor of 30 bigger than in actual neurons. Your manipulation of the conductances will be about 1000 times slower than a real action potential. This circuit is a slight modification to Circuit 1. 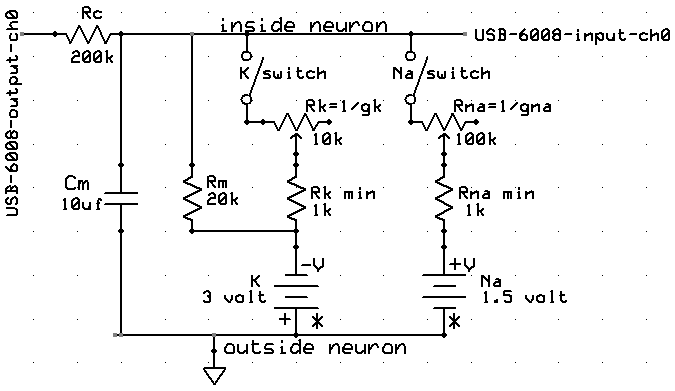 You need to disconnect 2 wires to insert switches and add an output from the USB-6008 to use as a stimulus. 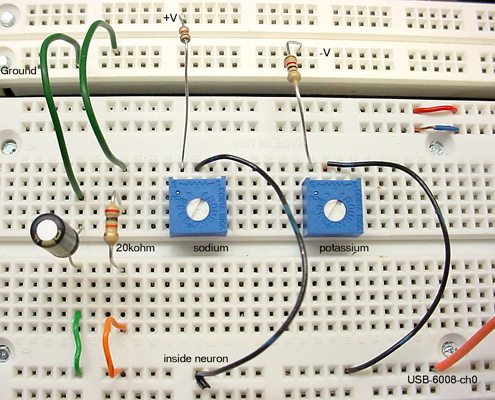 With this circuit, you will act as the voltage detector to trigger an action potential when you notice a depolarization. 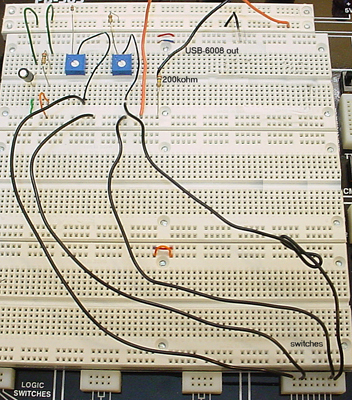 The schematic and three views of the protoboard are shown below. 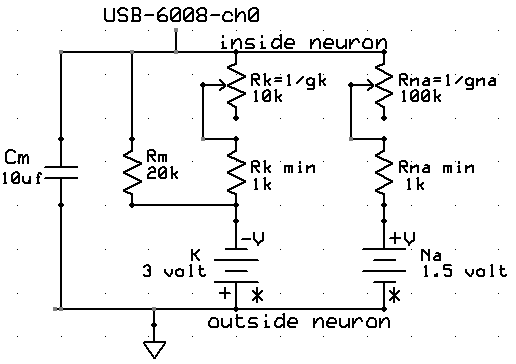 You can set up the USB-6008 to produce a voltage using a scheme like that shown below. Two traces are shown below. The first shows just the stimulus. The second shows my attempt at behaving like a voltage-triggered conductance generator by turning on the sodium conductance switch, followed by the potassium conductance switch. Both of the potentiometers were set to maximum conductance. Modify slowAIni.m to include uicontrol edit fields for dt and max time. Add uicontrol buttons to start plotting voltages and to quit the program. You should be able to start the plotting several times (perhaps after adjusting the time parameters) without restarting the program. 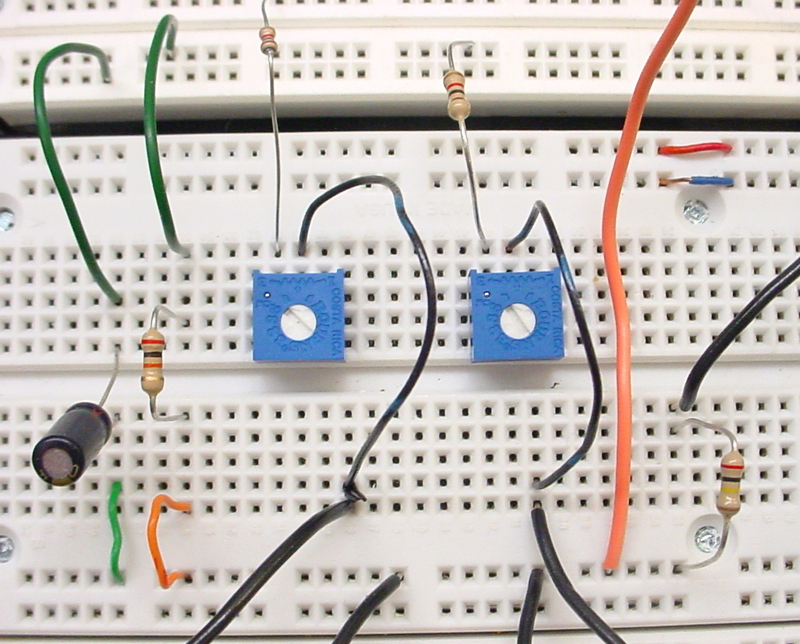 Build Circuit 1 above and use your modified program to record some voltage traces. For each of the manipulations below, describe what you see. Include all voltage recordings in your report. Vary only the sodium conductance over its full range. Set potassium to minimum conductance (ccw). Repeat with potassium set to maximum conductance (cw). Generate a waveform which resembles an action potential with positive overshoot caused by a large sodium conductance, followed by a hyperpolarization caused by increased potassium conductance (and low sodium conductance). 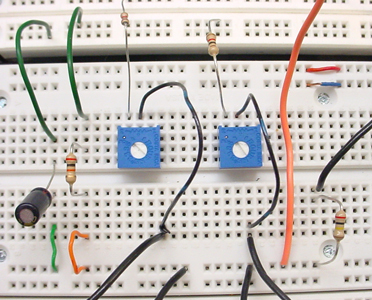 Build Circuit 2 above by slightly modifying the existing circuit. Be sure to set the two potentiometers to max conductance. Further modify your program to produce a 1 second long 5 volt pulse about 4 seconds after the program starts recording voltage. For each of the manipulations below, describe what you see. Include all voltage recordings in your report. What is the time constant of the model cell with both switches open? Start the trace and after about 1 second, turn on the potassium switch. What happens to the stimulus amplitude. Why? Measure the cell time constant just after you turn on the switch, then again just after you turn off the switch. What are the values and why are they different? 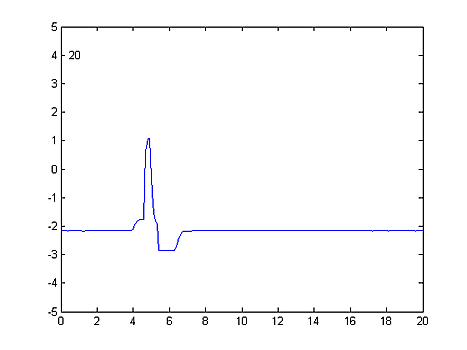 Simulate an voltage-triggered action potential by waiting for the stimulus pulse then flipping switches. Set the sodium potentiometer to 50% and repeat 3. This condition might correspond to poisoning half the channels with TTX. Increase the membrane capacitance to 100 uf. and repeat 3. Screen shots of the various waveforms you recorded.